Concrete does not have to be heavy to be strong. Poraver is an innovative lightweight aggregate that can reduce concrete weight by up to 50% with good compressive strength. Poraver is available in eight size-ranges, from #400 mesh (.04mm) up to 5/16” (8mm). Made from post-consumer recycled glass, Poraver is 80% lighter than silica sand, and can make 4000 psi concrete that weighs just 100 lbs/cf. It also makes concrete a more "green" material, increasing energy efficiency and reducing jobsite hazards. Poraver enhances concrete flow and handling and, unlike conventional lightweight aggregates, does not require pre-soaking. Lightweight concrete is not a new concept, but the materials usually used to make it create challenges in processing and handling. Conventional lightweight aggregate is porous and absorbs large quantities of liquid. In order to prevent it from robbing the concrete of needed moisture, it has to be pre-soaked with water for up to 24 hours before being included in the mix. Poraver eliminates many of these challenges, making lightweight concrete that is more user-friendly and more environmentally friendly. Poraver is foamed glass in granular form. Made from recycled glass, using a proprietary process invented by the German company Dennert Poraver over 30 years ago, the spherical grains are 80% air. With a far less porous surface than lightweight aggregates such as expanded shale or expanded clay, Poraver absorbs much less moisture. It does not require pre-soaking: supersacks (FIBC) can be added directly into the truck without measuring or metering, one supersack per three cubic yards of concrete. Lightweight does not mean low strength. 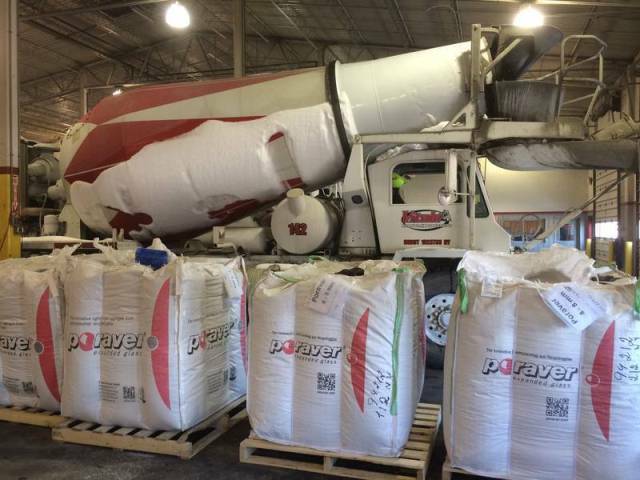 In recent testing, Poraver concrete weighing just 70 lbs/ft3 (dry density) achieved compressive strength of 2000 psi. At a density of 100 lbs/ft3, the concrete reached 4000 psi. Poraver meets or exceeds ASTM C330 Standard Specification for Lightweight Aggregates for Structural Concrete, and ASTM C332 Standard Specification for Lightweight Aggregates for Insulating Concrete. Unlike natural aggregates, which vary considerably from location to location, the physical properties and chemical properties of foamed glass are highly consistent and reliable, making concrete mix design easier and more predictable. Poraver is available in eight size-ranges, from #400 mesh (.04mm) up to 5/16" (8mm), with very precise particle size distribution. The uniform spherical shape of the grains also helps concrete to flow and pump more freely and finish more easily. Concrete made with Poraver has numerous sustainability benefits and can help achieve environmental certifications. Poraver is made 100% from post-consumer recycled glass, and may contribute towards LEED points for recycled content. Moreover, Poraver contains no crystalline silica, reducing job-site hazards when concrete is cut, and potentially helping compliance with the latest, more stringent OSHA standards for crystalline silica exposure. Poraver's high air content gives concrete improved thermal insulating properties, with values up to R=0.5 per inch; a six-inch concrete wall would add R=3 to the efficiency of a wall assembly. (By contrast, the insulating value of ordinary concrete is so low that it is often not even included in the calculation). Poraver also improves sound insulation and noise reduction. It has excellent freeze-thaw performance, minimizing the need for air entrainment. Poraver for the US and Canada is made in Innisfil, Ontario, Canada. The manufacturing facility is located within 500 miles of many major markets in northeastern US and eastern Canada, where it would comply with LEED MR Credit 5 for Regional Materials under the current LEED system. Poraver is available from distributors all over North America, potentially making it eligible as a regional material under the upcoming revision, LEED v4, in many locations across the continent. Poraver North America is a wholly-owned subsidiary of Dennert Poraver GmbH, Postbauer-Heng, Germany. Poraver can be substituted for conventional aggregate in a wide variety of other cementitious products including mortar, grout, and plaster, as well as many non-cement-based composite materials. Poraver is chemically resistant and ASR resistant. For applications and mixes, including specialty concretes, where water/cm ratios are critical, Dennert Poraver has developed Poraver-X. This closed-cell granule product features ultra-low moisture absorption to improve the accuracy of the mixes and reduce consumption of binder materials.